As of September 1, 2018, the state of Mississippi has introduced its Lottery Law. Senate Bill 2001 was approved by Governor Phil Bryant in the end of August 2018 and has now been enacted. The Mississippi Lottery Law creates a complete framework for the creation and operation of the lottery in the state. It also establishes the Mississippi Lottery Corporation, which administers the lottery and oversees the activities of all relevant partners and contractors, including lottery retailers. As a part of the proper functioning of the lottery, the Board of Directors of the Corporation is entrusted to create and enforce requirements for lottery retailers. Among the criteria you have to meet if you want to be allowed to operate in the state as a retailer is to obtain a lottery bond. Below you can find what the new legislation entails for Mississippi lottery retailers and the overall functioning of the lottery in the state. With Senate Bill 2001, state legislators set the foundations of the Mississippi Lottery Corporation. The purpose of having this entity is to run the lottery in an entrepreneurial way, but make sure that it remains accountable to the Governor and applicable state laws. The Governor has already appointed the Board of Directors, and the Corporation is expected to start running in 2019 after it has hired a full-time President. The Board of Directors of the Corporation is the authority that is in charge of forming contracts with retailers who sell lottery tickets to the public. It has to create a clear framework how they should operate. For that purpose, it needs to set requirements that any party who wants to engage in lottery ticket sales has to meet. The Board has to examine and select the appropriate candidates and then conclude agreements with them. Among the criteria that is embedded already in the law, lottery retailers have to obtain a surety bond or a letter of credit. The amount is set as on the basis of your average lottery ticket sales. The Mississippi Lottery Law authorizes casinos in the state to function as lottery retailers. 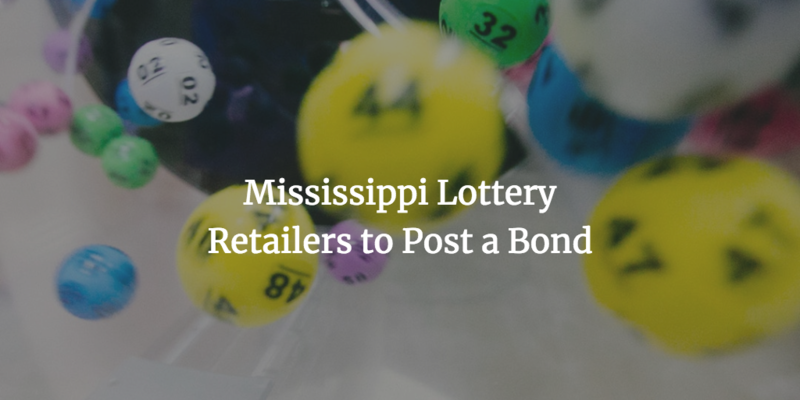 The purpose of the bonding requirement is to guarantee that you will follow applicable Mississippi laws in your operations as a lottery retailer. The bond amount that you have to post should not be more than twice the average lottery ticket sales for the period within which you have to remit lottery funds to the Corporation. For the first 90 days of your operations, the basis is the estimated average lottery ticket sales. In order to get your lottery bond, you have to apply with a surety. It examines your personal and business financials, so that it can assess the level of bonding risk. The bond cost that you have to pay is a percentage of the required bond amount that you have to post to the Corporation. The more stable your finances are, the smaller the bond price is likely to be. If your overall profile is solid, you can expect to pay about 1% to 5% of the bond amount. Still have questions about your Mississippi lottery bond? Don’t hesitate to get in touch with our bonding experts at 877.514.5146.